Oil prices have plunged to one-year lows, but refiners in certain parts of the U.S. are not benefitting from cheaper crude. According to new data from the EIA, refining margins for motor gasoline have fallen to five-year lows. “Flattening year-over-year growth in gasoline demand in the United States, combined with high levels of refinery output, have contributed to low or negative motor gasoline refining margins for refiners along the East and Gulf Coasts,” the EIA said on November 27. 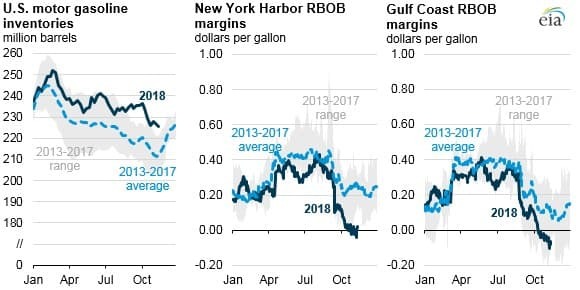 Gasoline refining margins have been declining since August. In November, U.S. gasoline demand is expected to have averaged 9.2 million barrels per day (mb/d), down 262,000 bpd from a year earlier. 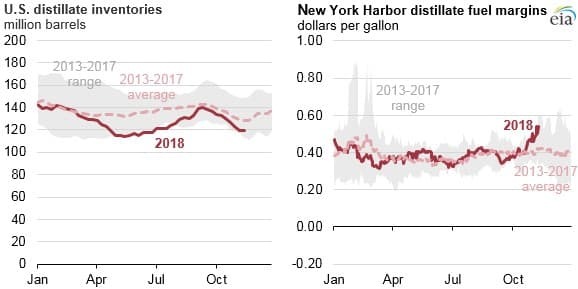 Meanwhile, prices for distillates, such as diesel, are much higher. The discrepancy is notable, and the markets for gasoline and distillates have diverged sharply this year. The forthcoming 2020 International Maritime Organization regulations on sulfur content in maritime fuels is set to push extremely dirty heavy fuel oil out of the mix for ship-owners. One of the most important replacements for fuel oil be diesel and gasoil – in other words, distillate demand is set to spike at the start of 2020. In anticipation of these regulations, distillate prices are seeing upward pressure. With diesel prices on the rise and gasoline prices heading in the other direction, refiners might want to maximize diesel output. However, things aren’t that simple. As the EIA notes, for every barrel of crude oil processed in a refinery, it tends to yield twice as much gasoline as it does diesel. 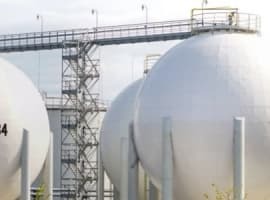 “As a result, although gasoline margins have been low recently, refiners cannot completely stop making gasoline in favor of other petroleum products, such as distillate,” the EIA said. But because diesel prices are favorable, refiners are simply churning out product as quickly as possible, which is exacerbating the emerging supply glut of gasoline. This wouldn’t necessarily be a huge problem except that gasoline demand has stalled out in the United States. Part of that is the hangover from higher fuel prices earlier this summer. In essence, refiners are chasing diesel, dumping gasoline onto the market, at a time when consumers have been pulling back. The result has been gasoline supply outpacing demand, which translated into unusually large storage levels. Typically, as peak summer demand season gives way to autumn, refiners go offline for maintenance, which leads to a drawdown in gasoline stocks. But the combination of higher-than-usual refining runs and weak demand meant that gasoline inventories held up through October. To complicate matters further, much of the surging oil production the Permian basin is light in quality, which means that it tends to be better suited for gasoline production rather than distillates. The recent plunge in crude oil is starting to trickle down into lower pump prices, which could yet provide a bit of a spark to demand. Indeed, in the most recent data release from the EIA, gasoline stocks edged down ever-so-slightly, continuing a downward trend since October. Still, gasoline inventories are at the upper end of the five-year average range at 224.6 million barrels for the week ending on November 23. It will be interesting see how this affects various refiners and even the integrated oil companies. 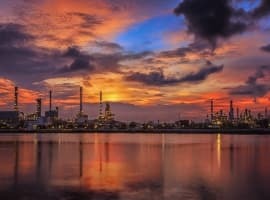 During the oil market downturn that began in 2014, the oil majors suffered from low crude prices, but did better than pure-play upstream producers because they had their refining units to cushion the blow. Cheap crude stoked demand for motor fuels, and the oil majors benefiting from very large margins on refining. This time around, the narrowing margins for gasoline is ill-timed since it is also occurring alongside a downturn in crude prices. As the EIA notes, this is likely temporary. 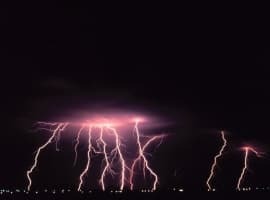 But it wasn’t so long ago that most analysts and industry executives saw 2018 shaping up to be a hugely positive year. The simultaneous meltdown in refining margins and crude oil prices could dash those hopes. IMO, this is an obvious consequence of the post-2005 increase in global condensate production as a percentage of total global crude + condensate (C+C) production, and the corresponding decline in actual global crude oil production as a percentage of global C+C production.